Daily Illuminator: A No-Brainer For GURPS Fans! July 20, 2016: A No-Brainer For GURPS Fans! Zombies: Can't live with 'em, can't lock yourself indefinitely in a fallout shelter and hope they go away. They're fan-favorite monsters, they're everywhere in popular culture, and now they've invaded the pages of Pyramid, with Pyramid #3/92: Zombies, the latest issue of the long-running magazine for gamers. Our feature article this month from Sean Punch (author of GURPS Zombies) provides insight and techniques to allow players to come back as zombie characters with free will, whether drawing on magic or science. This issue also offers an overview of Norse undead, complete with GURPS stats, from GURPS Vikings author Graeme Davis; a zombie-themed danger to wearers of an omnipresent TL9 battlesuit, from the pen of GURPS Ultra-Tech co-author David L. Pulver; and an adventure spotlighting a mad scientist's plans, perfect for GURPS Monster Hunters. But that's not all! This issue keeps pouring forth zombie-themed badness like endless hordes of restless dead. Learn about a church that longs to look after your soul when you die (or perhaps before), with three GURPS templates; two new systemless zombies that push the edges of terror; thoughts on how to keep zombies terrifying even when you know they're there; and still more -- including another Matt Riggsby-scribed vignette set in the new Car Wars universe! Whether you're in the far-flung future, a magic-filled past, or a modern-day romp, zombies can spice up any campaign. 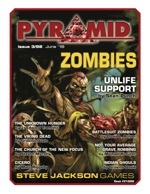 Pick up Pyramid #3/92: Zombies individually, or subscribe today for many this issue and more months of surprises!